Coin Drive "Every Penny Counts!" What did you think of that spectacular Carnival on Friday? Our PTO Board truly outdid themselves in working together with our SJCA Staff (teachers, staff, and Admin), Room Parents, our CCC and SJCA parent community in ensuring a fun-filled time for students to enjoy each other. Did you know there were 311+ volunteer positions necessary to run this carnival in the four-hour period? This doesn't include the time to arrange the food, entertainment vendors, work with Room Parents who collected, arranged and prepared the Silent Auction baskets, the preparations for signage, decor, communications with the community. All of these volunteer preparations began in late May 2018. I especially want to thank our PTO Board who has worked tirelessly to make this wonderful event such a success. Silent Auction winners are listed on the attached document. You will be contacted and be able to schedule payment this week. Your input is valuable! Thank you for sharing your feedback regarding the Parent Tips sent on to parents. As you may have seen on Saturday, Mrs. Hale will now be sending these out weekly to allow you the time over the weekend to review it on your preferred timetable. ParentSquare is a valuable communication vehicle. We need to ensure you are able to access timely classroom and community-related updates for your children. We all want our children to be happy, more peaceful, more attuned to others’ needs, and to be able to regulate during stressful times. The best way for them to learn these skills is through watching their role models practice it. Yet, what does it mean to be mindful? And what does it mean to parent mindfully? How can we become more present with and for our children when life can be so incredibly busy? How can we begin to emotionally coach our children and help them thrive through adversity? In our time together, we’ll explore these questions and understand the why and how of mindful parenting. This session will be active, fun, and you’ll learn a ton! Our CCC Steering Committee invited author, Hena Khan to conduct workshops and engagements with our 3rd through 6th grade students. Students were able to learn about her, her childhood experiences, her published books, the creative process and her character and plot inspirations. They learned that her inspirations are based on everyday experiences, just like our own. Three cheers for our 8TH GRADE STUDENTS who engaged our Kindergarten students in their test run of the Wobbegong Arcade they designed and built for the Carnival! Did you have a chance to see their well-built arcade? It entertained children of all ages! Please lower balloons, cameras, etc. to ensure they are not blocking the vision of others behind you. "Adulting" can be hard, parenting, while rewarding, can be even more challenging! As much as we love our children, many parents express concern about whether they are "handing a situation 'right' or 'correctly'." At the end of the day, discussions with other parents in sharing what has worked or not with them help give us all some context and understanding. That's what is most appreciated with the 8a Parent Square messages being sent by Mrs. Hale. It is starting a conversation with parents and helping us to navigate together. SJCA Carnival is approaching this Friday, September 26! Get ready for some family-friendly fun! The Sharky balloons will be back, bouncers, game trucks, train rides and most fun -- the games with fellow students and teachers! Thank you, PTO and all volunteers for helping to make this event such a success for our Sharky community! Three cheers for our JA and 5th grade students who were mindful of the construction work to our Volleyball courts last week Monday and Tuesday. The Volleyball court was being finished with the top layer of soft surfacing. It was imperative that nothing land on it. If it did, the damage would be permanent. We had to ask JA students not to use the basketball and volleyball court area, on Mondayand Tuesday. While they willingly complied, everyone knew the students were giving up a beloved lunchtime pastime. If you could see how hard the students play at lunch, you'd know this activity is a favorite one to give up. The 5th grade students willingly gave up the use of the elementary basketball courts to allow the JA students to play on Tuesday! A critical aspect of leadership is being willing to make a sacrifice for the greater outcome for everyone. Thank you, JA and 5th grade students! It was great to see so many students at Yogurtland last week Friday! Thank you to all who were able to visit through Friday afternoon and evening, standing in the lines and supporting our school! The Rocket Pop flavor seemed to be a crowd favorite, along with a healthy serving of gummy bears! We were able to take a picture with a few Sharky pals! 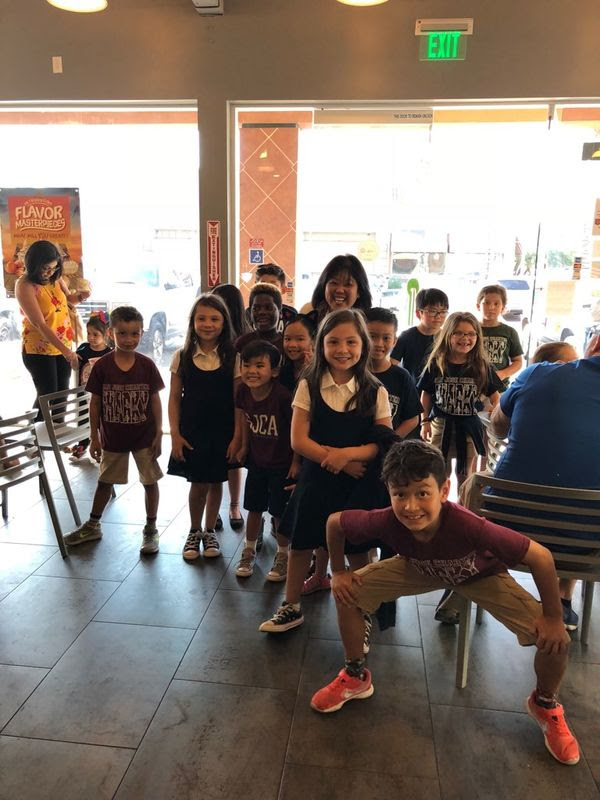 Our third-grade students were the first students to go on a field trip! They went to the Los Angeles County Fair. Thank you to our PTO who funds the bus fees for all student field trips! Here's a teacher lunchtime photo, taken by one of the chaperones! Students were hot, but had a wonderful time together! 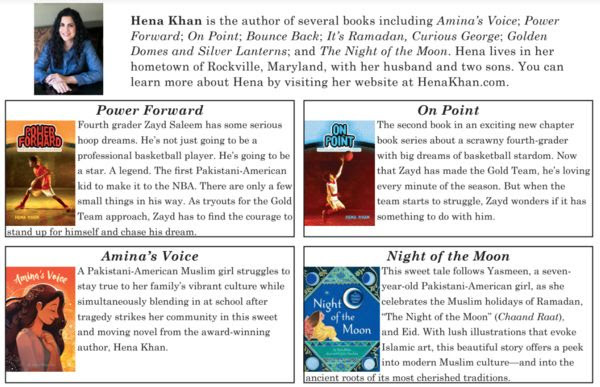 We are going to have an author, Hena Khan, visit our school on September 28 to conduct a workshop for our 3rd-6th grade students. All students will be able to order her selected books. If you would like a personalized and autographed book to pre-order, the order form is attached. Books will be delivered to the school and distributed to students. All forms should be submitted to HOMEBASE teachers. The first Parent University was held this past Thursday, providing parents with an opportunity to come together and interact with one another. Topics discussed: the SJCA Opportunity, Standards-Based Learning, Parent Expectations Support Achievement (PESA), The Leader in Me, and future workshops. Many thanks to Mrs. Hale, Mrs. Spickler, Ms. Velarde and Mrs. Silva for leading the first session! "As a parent, being informed what my child is learning, graded, or exposed to is very beneficial for me to talk about at home with them. Parent University is a wonderful resource." "It informed me of how teachers will be assessing students and also how to ask questions to get more out of my kids." "I'm excited to apply The Leader in Me at home so the kids can apply why they have learned at school at home." The Leader in Me and 7 Habits of Highly Effective Families were titles that could be checked out by our family members. Please see Mrs. Sanchez in our Elementary Library to check a copy out. The session was recorded and will be put up onto our website once it is edited and ready to publish. Is your 5th-8th grader an involved community volunteer? Consider applying for the Prudential of Spirit Community Award. 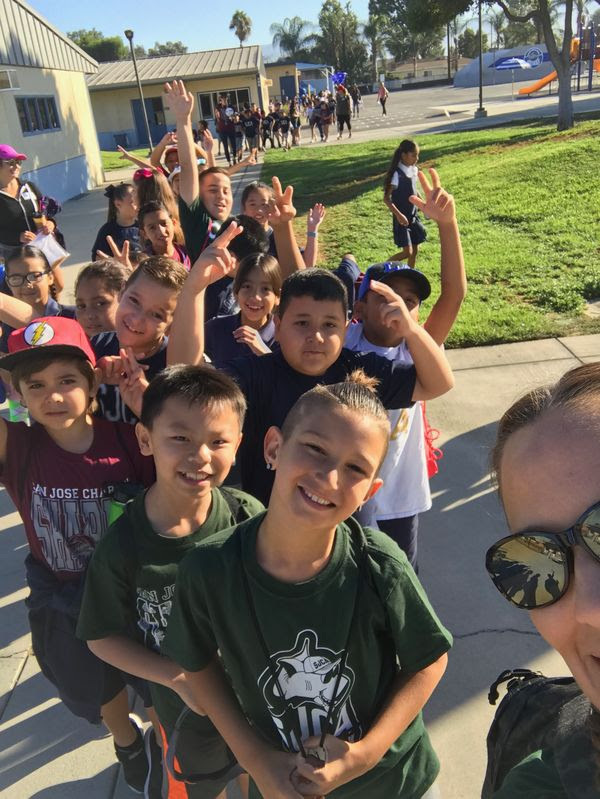 The information was posted to 5th-8th grade families by Ms. Lemus. The link to view is here: Prudential Award. There are lots of students who are active in the community. I hope many students consider applying for this recognition. Happy September! We are into a rhythm now that the school year is underway! We begin quite a few learning pathways this month! Morning and afternoon lab and homework sessions begin on Tuesday. Our Success For All reading classes begin the same day for all first- through fifth-grade students. Families are not left out -- our Parent Universitysessions begin on Thursday, September 13th. Here's more information Mrs. Hale sent out last week: click here. Today, Labor Day, is a "creation of the labor movement and is dedicated to the social and economic achievements of American workers. It constitutes a yearly national tribute to the contributions workers have made to the strength, prosperity, and well-being of our country" (Dept of Labor). Together, as an SJCA community, we strengthen our families, our neighbors, and the communities we work and live in. Thank you for sharing our school's story with others and also sharing ideas that are being done elsewhere. 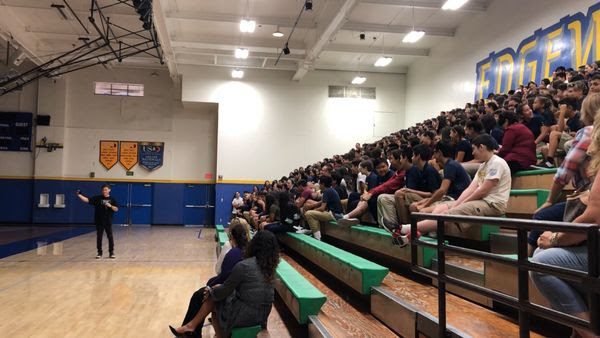 We had two rare, but meaningful assemblies for our students, 1st-8th grade this past week. The elementary students participated in the City of West Covina-sponsored assembly, EcoHeroes. 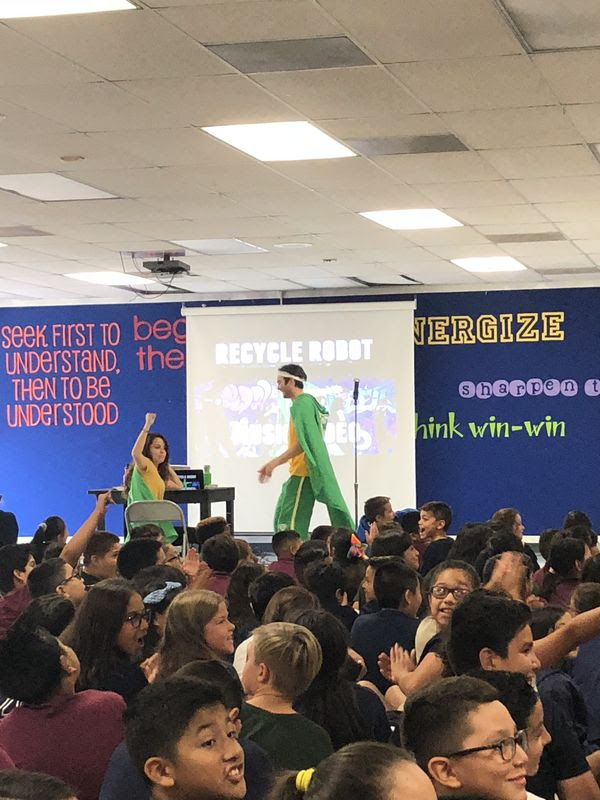 Students, through song, rap and humor, learned about micro-plastic, the power of recycling, and how each can make a difference, being an EcoHero. The Junior Academy students participated in a Teen Truth assembly, led by Jared, a Teen Truth speaker. He related to our students and adults, alike, in a meaningful way. He left the students with one question to consider, "What are you going to do to make a difference?" We want to thank Edgewood High School for allowing us the use of their gym for this incredible experience. Wed., 09.05 PICTURE DAY! Bring your smiles!